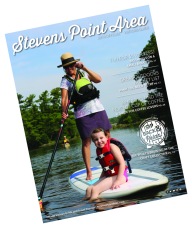 You could win a $500 arts getaway to the Stevens Point Area this spring by entering the Celebrate the Arts Spring Sweepstakes. Enter by May 30 for your chance to win an arts-centric getaway, including tickets to a UW-Stevens Point Performing Arts Series performance in 2014-15, artworks from local artists at Q Gallery, $250 spending cash and more! Find more arts events here.